Believed to be the dwelling in which Mary lived out her last days, The House of the Virgin Mary has long been a popular visitation site for a variety of pilgrims, including several popes. Beautiful. Small but the experience of just being in the house, even briefly, was worth the visit. Not worth seeing in my opinion. Not worth seeing in my opinion. But it was part of the tour so we went in. Able to see the home and collect Holy Water. House of Virgin Mary was a very nice spot. House of Virgin Mary was a very nice spot. It is either a religious pilgrimage or just an interesting thing to see. Wow - off the beaten path, could never do it without an excursion. Wow - off the beaten path, could never do it without an excursion. I&apos;m not religious but it was a powerful moment. Only complaint is that they speed you through the house single file and you can&apos;t take a moment to take it all in. It was nice to visit since the crowds had not yet arrived. It was nice to visit since the crowds had not yet arrived. Had it been much more crowded, I would not have waited to tour it. We enjoyed the visit to Virgin Mary&apos;s house and the holy water which we were able to take home. We arrived early to beat the crowds. We arrived early to beat the crowds. Very moving to visit this house where Virgin Mary last lived. We arrived early prior to the great crowds. We arrived early prior to the great crowds. Is a meaningful stop and we were not rushed. I don&apos;t believe in these superstitions - have you ever heard of dinosaurs? We were able to go inside her house. Scenic drive, well done. Cafe and a couple of little shops. Very inspiring to know Mary once lived there. Mary&apos;s house and Ephesus was one tour. The guide took us here first in the early morning. The guide took us here first in the early morning. No crowds just a wonderful peaceful experience. Van tour with guide and driver of this area and more. 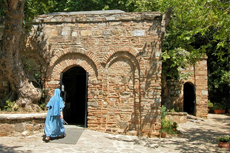 House of the Blessed Virgin Mary and Ancient Ephesus. An awesome experience. Don&apos;t miss it. Very special place for Christian. Very special place for Christian. A Chapel now. Very peaceful and lovely place.